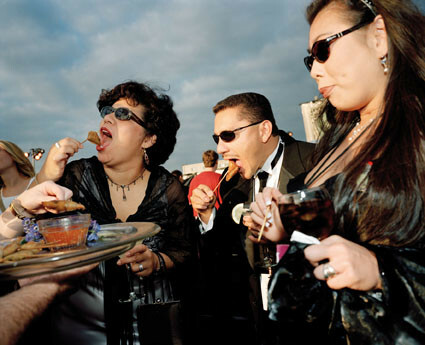 Martin Parr has consistently produced work that highlights the frailties of the British working class, perhaps?. This may be a crude description of the work - but I cannot help but feel ambivalent/troubled by the way of looking. We are presented with lurid images that seem to present a particular stance on the part of the photographer - is this sneering contempt or genuine empathy? there is a focus in Parr's work on the 'taste' of the subject - his clever use of objects/signs that connect you to the subject on both a personal and political level. Roland Barthes would call this the studium and the punctum, twin mechanisms by which we are enabled to 'read' an image - but there is inevitably an element of taste at play here and it is bound in to the culture and politics of the photographer and the viewer.